Plot Summary: In a crime-ridden future Japan, Kyouhei Tachibana is a peaceful student at a culinary school, dreaming of going to France for advanced study as a pâtissier (pastry chef). To afford the trip, he accepts a part-time job as private cook to a strange group of women: Sei, Meg, Jo, and Amy. 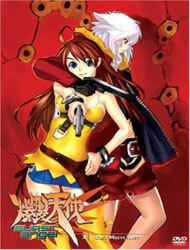 To Kyouhei's astonishment, they turn out to be a band of violent mercenaries, and he finds himself in the line of fire.